The health technology industry is undeniably one of the most exciting and financially lucrative sectors for a company to be involved in at the moment, and even more exciting due to the number of innovative startups making a splash in that space. One such company, One Drop, is looking to garner name and fan base with the release of the One Drop Chrome blood glucose monitoring kit, which is capable of producing accurate readings from a user in an impressive five seconds. 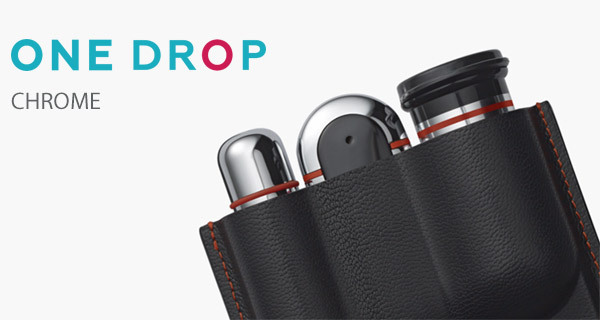 The One Drop Chrome kit, which will immediately get coverage and users due to the fact that it’s actually being sold directly by Apple via Apple.com, has received full approval from the Food & Drugs Authority (FDA) in the United States, and CE in Europe, meaning that the likes of Apple can be safe in the knowledge that it poses no harm to users, is safe for sale, and does exactly what it’s intended to do. The product itself comes as a Bluetooth-enabled blood glucose meter with an accompanying lacing device manufactured from beautiful chrome. The contents also include a set of test strips and a leather carrying case. Of course, given the fact that this hardware is Bluetooth-enabled, and sold by Apple, you would assume that it also offers some form of intelligence and smartphone connectivity; and you would be right. The One Drop Chrome is compatible with iPhone featuring HealthKit and CareKit support, with it not only being able to take accurate blood glucose levels in just five seconds, but also to send those results directly back to the accompanying iOS app, compatible with iPhone, iPad, and Apple Watch. Similarly, Android users can also get in on the action using a dedicated Android app. The hardware itself is a fantastic example of beautiful product design mixed with real-world usefulness, and will be particularly interesting to Apple due to the company’s laser-focused importance on health care. Interested consumers can purchase the hardware directly from Apple for $99.95, and subscribe to One Drop Premium for a $39.95 monthly fee. Apple user will buy any thing and 39 a month. My one touch only take 5 sec to. Stuff I don’t need in my watch. Don’t like it, don’t buy it. Don’t be an @sshole. What you feeling got hurt . Quit being a trump. Someone say some from experience and you get mad and want to call people names. As a diabetic I never one had to have my results on my watch. And I don’t need to pay 39 a month to use the service. And I told the truth Apple user will buy any thing . I’m diabetic too. I don’t want this, but I’m sure there are some people that would like it. What’s it got to do with Trump. Have the Apple users traumatized you? You need a safe space? A puppy? Some crayons? You were basically calling people that might like this, stupid. Hence, you were acting like an ahole. Seems you’re the one with hurt little feelings. Since you a diabetic you show know how much test strip cost. So you going to pay that and 39 a month for the app . It is stupid. Just to show it on your watch. Your the one with thin skin. Apple gouge there user every year. And you they take it . Because Apple says it courage or some made up thing and apple user don’t see it. So take how you want. So fell proud to stand up for a company that only care about how much money they can get out of you each year for basically the same device. To answer you question about Trump. Trump isn’t smart enough to keep is mouth shut when something doesn’t have to do with him. He also like to call people names to try and get his point across. You may learn something today. You can’t change someone else opinion nomatter what it’s . It’s there opinion not yours.